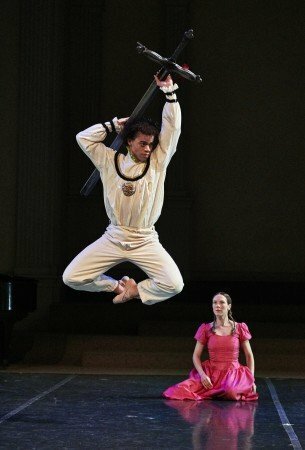 The venerable New York Theatre Ballet opened its 2017-2018 season with another of its equally venerable “Legends & Visionaries” programs. Under the leadership of Founder and Artistic Director Diana Byer, these programs ae noteworthy for bringing together overlooked or long-neglected dances by legendary choreographers from Jerome Robbins to Merce Cunningham, Antony Tudor to James Waring, and new pieces by emerging choreographers, including Zhong-Jing Fang, Antonia Francheschi, and NYTB’s own Steven Melendez. 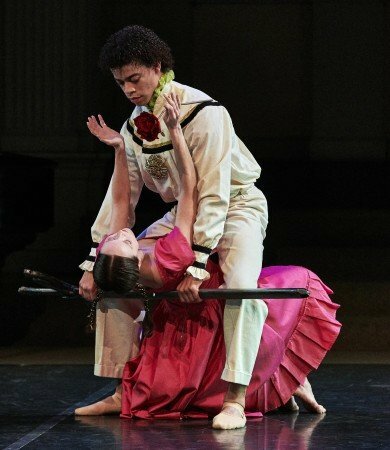 For this program, Byer resurrected Jose Limon’s La Malinche, presented the world premiere of Gemma Bond’s Optimists, and added dances by more established choreographers: David Gordon’s Beethoven/1999, and the return of Richard Alston’s A Rugged Flourish. The program, which I saw at the final performance of its run, proved somewhat uneven, but worth presenting. But before I go into detail, I must recognize that the engagement was dedicated to the memory of David Vaughan, who died on October 27, at 93. Vaughan, who had close ties with NYTB, had a lengthy career as a dancer, historian and writer, but I first observed him as a guest post-performance commentator. The breadth of his knowledge, and his ability to express the subject’s significance in terms understandable even to me, was invaluable. As Byer (and, via a written message, Alston) indicated, he will be missed. Limon’s The Moor’s Pavane, which NYTB presented several years ago (and which was a component of the first ballet program I ever saw), is one of my favorite dances. I had hoped that La Malinche would be in the same mold, and another masterpiece I’d not previously been aware of. It isn’t. But in certain ways the two dances are similar, and if nothing else, it demonstrates, yet again, how much some of us don’t know that we don’t know. And although it’s not the most captivating of dances, La Malinche belongs in one’s memory of significant Limon pieces. La Malinche was a real historical figure, and her story is fascinating – and much too complex to address in sufficient detail in this review. Suffice it to say that she was (or is asserted to have been) a Nahua Indian princess born around the turn of the 16th Century (the Nahua being distinguishable from their neighboring tribes, the Aztecs in the Valley of Mexico to the south and the Mayans of the Yucatan to the northeast), who after being sold into slavery became an interpreter to, and mistress of, Spanish conqueror Hernan Cortes, and was invaluable to Cortes in his conquest of Mexico. She also bore him a son, named Martin Cortes. After her death, however, La Malinche became a symbol of resistance to Spanish rule, inspired the Mexican Indians to victory over the Spanish, and is considered to be the mother not only of the mestizo “race” in Mexico, but of the Mexican nation. So, with the hindsight of centuries, some consider her a traitor, some a victim, and some a somewhat legendary and venerated heroine. With La Malinche, the first dance he choreographed for his own company in 1947, Limon drew on his memories of Mexican fiestas when he was a child, but applied the Modern Dance techniques that he learned via Humphrey-Weidman and others, and that he was to take in his own direction. Consequently, this piece has roots not only in Mexican legend but in Modern Dance form – just as Limon himself did. So La Malinche is a hybrid – a bridge between cultures, much like Limon himself. But I see another aspect of La Malinche, which I’m sure I’m not the only one to notice. Limon here has mined not only his mixed Mexican heritage, but the heritage of “street performance” dance. Between Norman Lloyd’s music (the composer, not the actor), and Limon’s structure, La Malinche comes across to me as a Mexican / Modern Dance form of commedia dell’arte, in which the story, although not expressed in any way as a comedy, is restricted to a somewhat perfunctory expositional form, with stylized elaboration keyed to the limited series of depicted (or symbolic) events. It’s not telling a story as much as recognizing and memorializing it: it’s theater that tells the audience/celebrants what they already know, via a “story” distilled to its essence and then selectively embellished. Indeed, seen this way, what Limon is doing here is adding limited emotional texture to the power of the depicted (but limited) physical action itself – a process that he expanded upon two years later in The Moor’s Pavane. So although the two dances appear very different (and are), they share a core similarity. Staged by Limon alumna Sarah Stackhouse, the dance begins with three characters entering the performing area, presenting themselves, and then assuming their roles. They proceed to act out the scenes that relate the La Malinche legend in a series of stylized mini-scenes, and then, the story finished, they bow to the audience and exit. Initially the three seem to be caricatures, but that’s part of the dance’s style. Cortes, played by Melendez, is the granite-faced conqueror carrying a “double-edged” sword (one edge being the blade of conquest, the other being the sword’s crossguard, hilt, and upper part of the blade, that together form the shape of a cross, representing the offering (or imposition, depending on one’s point of view) of Christianity. In contrast to Cortes’s sword, La Malinche, danced by Alexis Branagan, is armed with a red rose, which eventually is attached to (and later withdrawn from) the sword. Joshua Andino Nieto’s El Indio, the subjugated, then revolutionary, Native Mexican Indian, is at first a one-dimensional passive victim, but then with La Malinche’s inspirational assistance, rises up to throw off the Spanish conquerors. Given the limitations of the form, the three performers display remarkably vivid characterizations. Melendez’s Cortes is a stolid, wooden figure befitting the man who uses his position to entice and dominate La Malinche and then to emotionlessly destroy the native Indian population – and the scenes of him pulling the awed and entranced Indian girl up from the floor by the cross/sword that she grasps as if it (the religion; the power), not he, is what attracts her is remarkably potent even though the movement itself is limited. El Indio (who some consider a metaphor for Limon himself) is powerless in subjugation, but comes to life when he sees and eventually accepts La Malinche as his source of emotional and physical strength. It’s the most overtly dramatic of the three roles, and Andino-Nieto gives it remarkable life. La Malinche herself is the most complex character in the dance, but the complexity is a product of the action rather than any emotional overlay. What Branagan brings (this was the only one of the three performances in which she danced the role), beyond the clarity of her execution, is a clear sense of the heroine as youthful and naive (La Malinche was only 19 or in her early 20s when she became Cortes’s interpreter / consort), but also purposeful and resolute in her transition from traitor to spiritual liberator. And as she changes from Indian maiden to Spanish lady and then to inspirational leader, one wonders whether she, and not Cortes, was all along the one with the real power, and whether her relatively emotionless demeanor was intended to mask inner steel. Optimists is the fourth dance that American Ballet Theatre dancer Gemma Bond has choreographed for NYTB, and it’s one of her best. I don’t know where the title comes from and couldn’t discern its significance, but the pas de deux, to the third (Vivace) movement of Prokofiev’s Piano Sonata No. 8 in B-flat Major, op. 84, is non-stop action that is as exciting to watch as it must be to dance. Amanda Treiber danced as if electrified – although she always executes crisply, I don’t recall her ever moving with such exhilaration. But Erez Milatin was the revelation. Even though I was well aware of his capability from his years with Gelsey Kirkland Ballet, this piece showcased his remarkable speed and seemingly boundless energy. Optimists may not have the emotional depth of some of Bond’s other pieces, but it’s extremely entertaining. On the other hand, Beethoven/1999, the program’s other world premiere, is a puzzlement. Three women (Carmella Lauer, Elena Zahlmann, and Treiber) appear to vie for Melendez’s attention, and in the process, exchange glances, smiles, and pouts, and move dutifully to generally uninteresting choreography – all this while the action is loosely “framed” by ballet barres – for no apparent reason. If there’s a point to the piece, I failed to see it. And if it’s meant to be atmospheric without any particular point, it failed on that level as well. If I had to describe their roles, Lauer was the most smiley, Zahlmann the most bored, Treiber the most jealous and possessive, and Melendez not the least concerned about any of it (all of which appeared choreographically programmed – not any product of the dancers’ personal attitudes). Perhaps I missed something significant – that’s been known to happen – but on first view, there wasn’t anything significant to Beethoven/1999 other than the Beethoven music. Alston’s A Rugged Flourish, which I’ve reviewed previously and see as a different take on L’Apres Midi d’un Faune without the sensuality, concluded the program. Alston’s choreography is powerful and clean as a whistle, but the purported showing of the sole and dominant male’s acceptance “of company” as described in the program note seems disingenuous. As I’ve noted previously, if it were simply a matter of the heroic figure’s acceptance of community/company, why are there no male dancers among the “company”? Be that as it may, the piece received a capable performance from Milatin as the hero (or faune substitute), Dawn Gierling Milatin as the lead would-be companion (“nymph”), and Mayu Oguri, Monica Lima, Branagan, Lauer, and Treiber as the supporting nymph coterie. Although I consider the evening to have been uneven, it was well worth seeing for the enlightened curiosity that is La Malinche, and the visual (and physical) exhilaration of Optimists. If and when NYTB gives these dances an encore presentation, they’re worth seeing – as are the NYTB dancers – regardless of the other pieces Byer may include on the program.